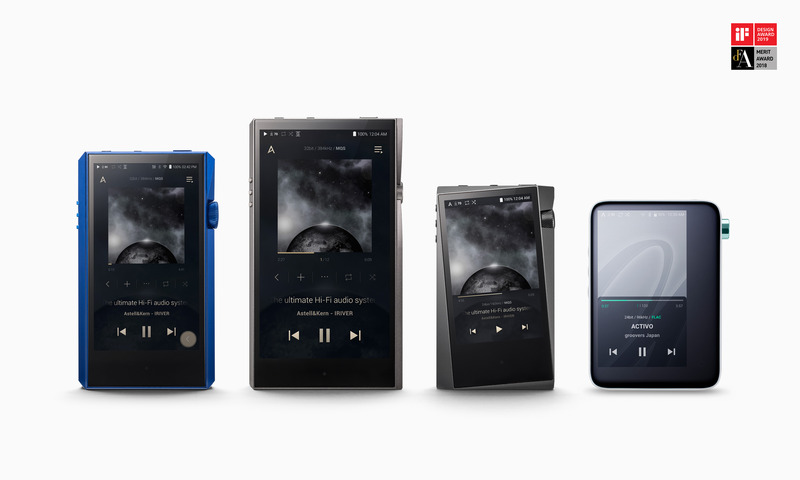 Irvine, CA – Astell&Kern, a global leader in portable high-resolution audio products, has won three iF Design Discipline Awards for the newest line of portable high-resolution audio players. A fourth award was won by IRIVER and Astell&Kern brand ACTIVO for their CT10 high-resolution portable audio player. The A&ultima SP1000M, A&futura SE100 and A&norma SR15 were recently named 2019 iF Design Discipline Award Winners. The ACTIVO CT10, powered by the Astell&Kern TERATON sound module, was also named a Discipline Award Winner. The iF International Forum Design in Hannover is the world’s oldest independent design organization and is awarding the iF design awards for outstanding design results annually. The three Astell&Kern and one ACTIVO players were selected as winners by the judging panel of 67 judges composed of experts from different. More than 6,400 entries were received from 50 countries compete in this competition. All four players are the latest high-resolution players available from IRIVER and Astell&Kern. The A&ultima line of players are equipped with two AK4497EQ DACs. A separate DAC (Digital to Analog Converter) is dedicated to each independent left and right audio channel, producing a wider soundstage and better stereo separation. With the addition of an Octa-Core CPU, the A&ultima line of players not only boot faster, but are able to process digital audio playback without lag or compromise in sound. A&ultima players support native playback of up to 32-bit/384kHz high-resolution PCM audio and native playback of DSD audio, up to DSD256, a Parametric EQ (PEQ), VCXO Reference Clock (Femto Clock) for minimal jitter and vivid, HD screens. The A&ultima line supports fast charging and data transfer via USB-C. The A&ultima SP1000M includes 128GB of internal memory, features a 4.1” HD screen and is available with an aluminum body in Blue Lapis or Black Onyx (North America only) for $2,399. The SP1000M Gold steps up to 256GB of internal memory, features a brass body plated in 99.7% pure gold and is available now for $2,999. The A&futura SE100 is equipped with a professional grade DAC chip from ESS, the SABRE ES9038Pro, which offers 8-channel procession of sound inputs. With 4-channels of dedicated processing per left and right channel, the SE100 is capable of producing even more detailed and clear sound with excellent SNR. The SE100 can play back up to 32 bit/384kHz PCM audio and can play Quad DSD natively. Thanks to an updated amplifier design and noise control technologies implemented by Astell&Kern, the SE100 produces 4.1 Vrms (balanced output) from its built-in amp only. The SE100 also features an Octa-core CPU, 5-inch touch screen, 128GB internal storage, support for fast charging, and can play back music for about 10 hours. Its aluminum alloy body design is solid and durable, and the classical design of the volume knob and diamond-patterned glass back plate completes the premium look and feel of the player when holding it in your hand. The SE100 has also been awarded a “Red Dot Design Award 2018”. The SE100 is currently available for $1,699. The A&norma SR15 is the first model from Astell&Kern’s new standard line of players. The A&norma line is designed to provide those new to high resolution audio a feature-packed introduction to the Astell&Kern brand. The A&norma SR15 is packed with several features found in previous Astell&Kern flagship devices so that even beginners can enjoy the fullest musical details when listening with an A&norma player. The SR15 uses two of the proven Master HIFI level Cirrus Logic CS43198 DAC chips, and features a Quad-core CPU which provides abundant power to process high-res music and creates an intuitive and snappy user experience. The A&norma SR15 can playback up to 24bit/192kHz PCM audio, and DSD64 natively. All of these features are packaged in a solid aluminum alloy body that resembles the popular AK70 series. The SR15 is currently available for $699. All current generation Astell&Kern players also include both 3.5mm unbalanced and 2.5mm balanced outputs, MQA, Wi-Fi connectivity, support for the AK Connect app, USB DAC function, DLNA networking support, OTA software updates, digital audio output via USB, aptX HD Bluetooth, microSD card slot to support additional storage up to 2TB, and support for some of the most popular music streaming services via embedded apps and the new Open App service (support for streaming services varies by country). The CT10 is the first high-resolution audio player under the ACTIVO brand. The CT10 offers a small-sized player that fits perfectly in a hand and brings all the details of a Hi-Res audio experience to listeners without compromise. Its Quad-Core CPU produces a snappy and quick user interface and supplies enough power to process large Hi-Res audio files during playback. The CT10 was designed by groovers Japan and IRIVER and features the new sound solution system from Astell&Kern, the TERATON TM200, which combines a DAC chip, Analog amplifier, independent power unit, and jitter-preventing clock together to provide a single chip solution for hi-fi audio playback. DLNA networking support in the CT10 allows it to stream or download music from a personal music library stored on a PC or local NAS device over Wi-Fi networks. Bluetooth connectivity, including aptX HD support for streaming up to 24-bit/48 kHz high-resolution audio over Bluetooth., allows the CT10 to be paired with headphones, earphones, BT speakers, car audio, or Hi-Fi systems for music listening. The CT10 can be used with a portable amplifier/DAC via USB connection, can serve as an USB DAC for computers, or can stream from popular music streaming services such as TIDAL, Spotify, Qobuz, Amazon Music, Pandora and others. Support for music services vary by country. The ACTIVO CT10 features 16GB of internal memory and a microSD card slot supporting up to a 400GB microSD card. With support for playback of high-resolution audio up to 24-bit/192 kHz PCM and double-rate DSD (converted to PCM), MQA and can play back any high resolution, lossless or lossy audio formats. The ACTIVO CT10 is $299. Astell&Kern players are available at US.AstellnKern.com and at audio dealers throughout North America. The ACTIVO CT10 is available now at Amazon.com and US.ActivoStyle.com.